I have such wonderful friends and family that know how much I enjoy tea things. I thought I would share some of the tea gifts that I have received in the last month. 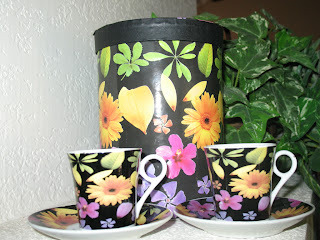 The first is a set from my friend, LW, that is just adorable. There are 6 cups and saucers. They are probably technically espresso cups, but wouldn't they be adorable little girl teacups? She is so sweet to think of me. Thank you LW!! The next was actually a gift from my Stepmother (I mentioned her in sad news). She had seen me eyeing this particular set last summer in a Cracker Barrel store on the way to take me to an out-of-town airport. It was so cute and clearanced for an insanely low price, but I did not have one spare inch in my bags! She went back and got it for me. 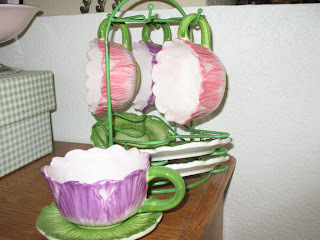 She even tried to get the matching creamer and sugar bowl, but as she went to pick them up - another lady quickly grabbed them. I guess my Stepmother even said that she really wanted to get those for her daughter, to which the lady replied, "Too bad." Wow! Wasn't that sweet of my Stepmother to think of me? She just gave them to me when I was visiting a couple of weeks ago. The last one was a surprise from a friend, MD, who found this and thought of me. 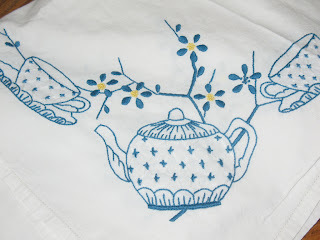 It's a lovely tablecloth with this pretty tea scene embroidered on each corner. I love it! Thank you MD!! Thank you, Lord, for blessing me with such wonderful friends and family! Don't forget to enter my Giveaway or the Giveaway on my Other Blog. Those are so aweseome. And the teacups from your step mother will mean all that much more. They are beautiful, and I agree with Kim, the ones from your stepmother will be cherrished for years to come. Maybe you can find the creamer and other things on ebay??? Wouldn't that be sweet? Have a nice visit with your dad, and treasure those moments as well. I am thinking of you.